There are several components in the calculation of the cost of spray foam insulation for your home or business. The first is the cost of the material itself. Open cell foam and closed cell foam have different costs per square foot with closed cell foam costing more. In order to calculate how much foam is required for your project, our contractor needs to measure the spaces that need insulating and using those measurements, determine how many square feet you need and how thick each square foot should be. Also included in a contractor’s calculation is the desired R-value needed for the space which determines the thickness of the material to be applied. New construction is somewhat easier to work with in terms of insulation as all spaces are accessible to our application technicians. The cost of labor is another component in the calculation of spray foam insulation costs. Open cell spray foam typically is installed in places that are easy for our crews to reach such as attics. 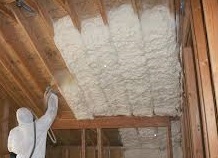 The cost for labor is thus a bit less expensive to apply open cell spray foam. Closed cell foam is usually applied in places that are harder to reach and take longer to apply thoroughly and effectively. Places like under stairs, or basements, or crawl spaces take longer to apply and the costs of labor for these areas is typically a bit higher. We always recommend that you have us look at your space to give you an accurate quote. Charts that show square footage and prices cannot take into account site-specific challenges that may require more time. Similarly, if your space is easy to reach, you may get a better quote if we know for sure that the space is easily accessible by our crews. Whether you insulate some or all of your building or home with spray foam, you will enjoy energy savings for decades over your other insulation options.